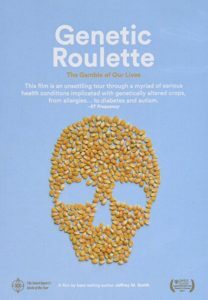 Jeffrey Smith just released an incredible new documentary called Genetic Roulette: The Gamble of Our Lives. It’s narrated by Lisa Oz (daughter of Dr. Oz) and features interviews with physicians, scientists, farmers, dieticians, chefs and educators all discussing the problems with genetically engineered foods. Americans get sick more often then Europeans and people in other industrial countries and we’re getting sicker. Since the mid 1990’s when Genetically Modified Organisms (Genetically Engineered Foods) when our food supply was taken over, without our knowledge or our consent. The number of Americans suffering at least three chronic illnesses nearly doubled. Why is this taking place? We’ve had an epidemic increase in cancer, obesity, allergies, autism, diabetes, asthma, and intestinal disorders. These are the same conditions that animals eating genetically engineered foods develop in the lab. It seems like we, and our children, are the guinea pigs of the biotech industry. And contrary to what ‘industry’ states, there are NO long-term safety studies. Genetic Roulette covers everything from the basics, What is a GMO? How are GMOs made? It also has a number of sections on the possible connection of GMOs to Allergies, Autism, Intestinal Damage and Birth Defects. There’s also a great section on the California Ballot Initiative – Yes on Prop 37 -that with the support of millions of Californians, will hopefully win in November. There’s a second bonus disk with three other short documentaries: Seeds of Freedom (narrated by Jeremy Irons), The Documented Health Risks of Genetically Engineered Foods, The Politics of GMOs and 12 short Public Service announcements. If you eat food this is a must see movie. Share it with everyone you know and lets get GMOs out of our food supply. Highly Recommended!